One of my most popular oils! 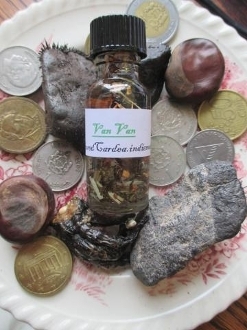 Van van is derived from the french-Louisiana pronunciation of vervain as "vaah vahn". It is traditionally created from 5 oriental plants; citronella, vervain, lemongrass, galangal, and patchouli. Though recipes vary slightly from worker to worker. All van van should contain lemongrass, some contain ginger or gingergrass. I use a relative of ginger-galangal root. Lovely lemongrass and citronella scent too! This the BEST all purpose oil! Anoint anything you like with it for extra oomph! It reverses bad luck, opens doors, creates opportunity, protects, and calls good fortune near! How can ya go wrong? Hard to find oil, and when you do, it's just synthetic, dyed junk. All my oils are created with fresh, organic, home-grown ingredients. The oil has "set" and charged for at least 1 year, and everything is prepared by me...no mass produced supplies here! Demand quality in your magick! feedback; "The first you notice about this oil is how chock full it is of goodies! Then you get the scent and WOW! I'm blown away once again by the quality of your products, Moma Sarah! This oil just radiates with goodness and I look forward to anointing my mojo bag, my gris gris, and maybe even myself, it smells so good! Brightest Blessings to you!" Ashe! Thanks for looking!